really, it’s a question of shopping strategy. personally, i’m much too picky to shop at my local flea market or vintage shop and just hope for the best–although i do pop in occasionally. but i need to see as many options as possible all at once. especially when looking for a specific pattern. saved Google search. configure Google to alert you every time the pattern you are looking for pops up. obviously, there can be a lot of false positives and broken hearts here. saved eBay search. configure eBay to alert you every time a pattern with the same number as yours comes up in an auction on its site. see above about false positives and broken hearts. but this only gets you so far. more often, my first step in a search is picclick. do you picclick? it’s a great GUI for etsy and ebay searches that helps overcome, to my mind, the major hurdle of each: a limited number of items per page. picclick posts all of the results for a given search on a single page, which makes for much easier browsing. 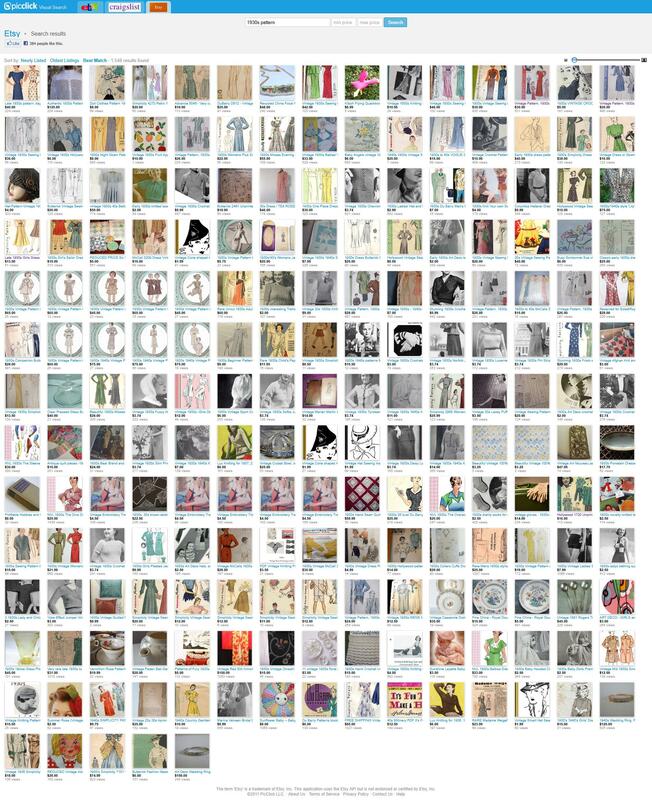 i find picclick particularly helpful when you are just trying to get a sense of the options in a particular era–for example, i love to run a general search for 1930s patterns and see what happens. but what about when you are looking for a very specific pattern? 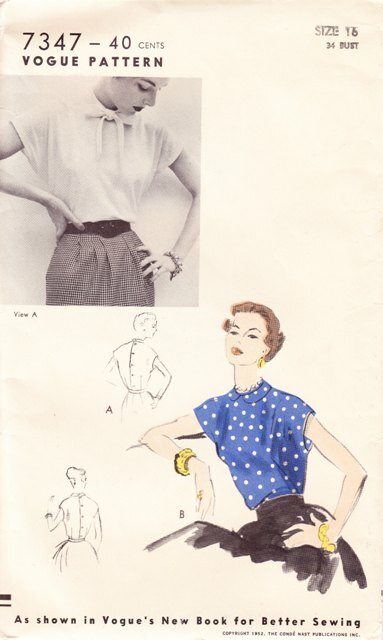 for a general example, i can’t be the only one out here who fell hard for several of the patterns featured in the Vogue New Book for Better Sewing, shown to such advantage on Gertie’s New Blog for Better Sewing. i’m sure there has been a steady run on what few copies of these patterns are left since Gertie began sharing her progress with us over two years ago. can’t find the VoNBfBS “background dress”? if you’re going to get really into it, go ahead and try a fitting pattern or a moulage. most of the pattern drafting ideas come from a basic block, which may as well fit you from the outset. 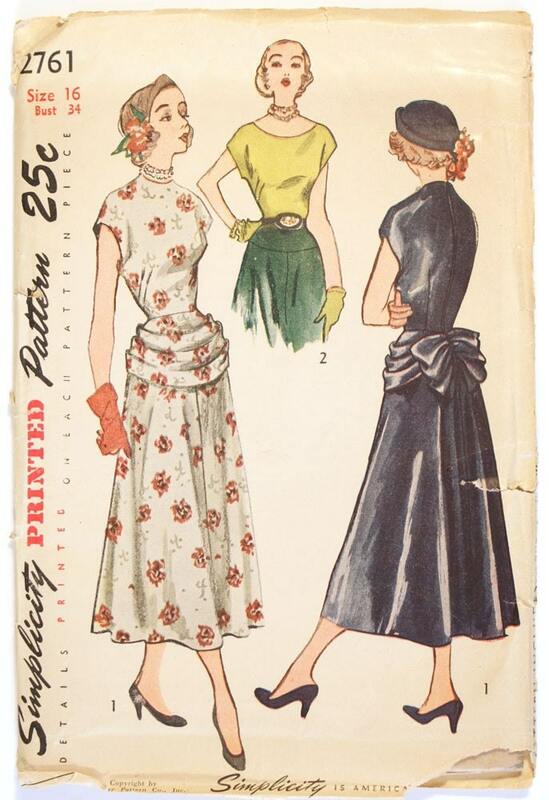 something that i’ve found to be really cool is the old fitting patterns from the 50s or 60s that pop up on etsy occasionally, especially if you’re looking to focus on a period. and don’t forget that if you are really into a certain look, say the 1940s or 50s, most of the patterns have a near-identical shape–the building blocks to your dream pattern may already be in your collection! Excellent post, Puu. This is a great reference – I’m going to find a space to link to this and similar articles up on the site menu. 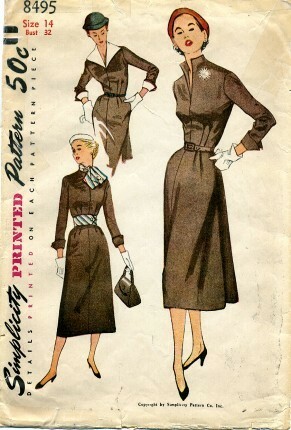 Another tip: the simplicity brand fitting patterns were called “bonus basic” (see the envelope pic here for an example: http://www.etsy.com/listing/75053578/60s-sloper-vintage-sewing-pattern-32) so that can be a useful search term. Wow! Great post! I have never heard about that, I just google images , thanks for the information, I am gonna do that. 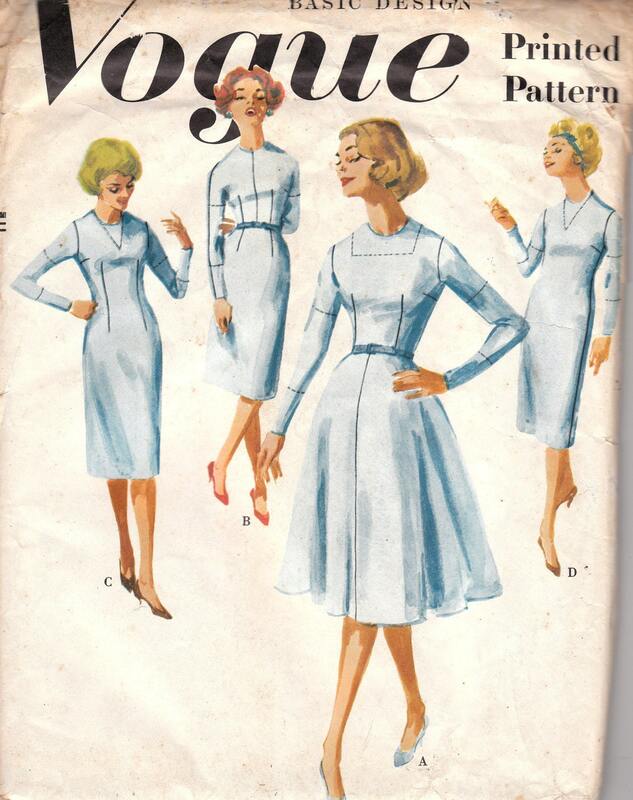 This is a great post, but, I think you’ve just created more pattern envy with Vogue 3000! The friendliest book I’ve found for drafting is Pattern Drafting and Grading by M. Rohr. It walks you through the steps to create a sloper from your measurements, then builds off of that by showing you an array of styles and how to draft them from your sloper. Of particular interest here, is that the styles that it represents are 50s to early 60s. It even shows you how to draft the bullet bra that is so important to getting that look right. This book pops up on Amazon (it recently went on EBay for less than $40.00!) and I have heard rumors of newer reprints and a CD Rom edition, although I have no idea if that has happened. Great post! I hadn’t thought about it, but indeed some patterns are very similar to each other. But then I’ve never hunted a specific pattern, I’m more on the lookout for an era or a type and style of clothing (if I even search for a pattern). thank you for all the feedback! 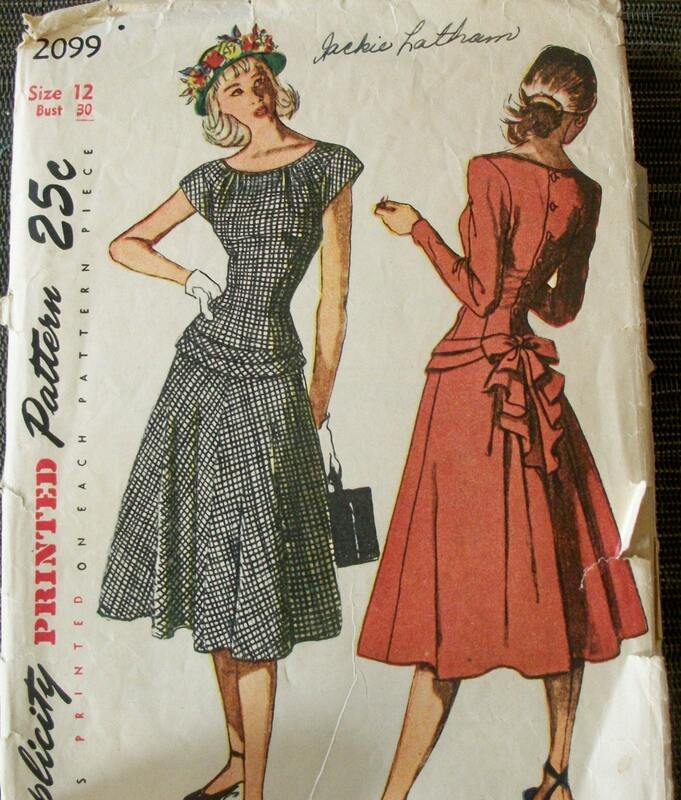 @wundermary, i love the idea of a pattern drafting book from the 50s, especially since i already have a sloper. i’m also investigating the halsam system from the 20s and 30s if anyone knows anything about that. Ah, you just sent me scrambling to my sewing room to look at my publications! I have a copy of Drafting and Pattern Designing, Published by Woman’s Institute of Domestic Arts & Sciences, Inc., 1924. It is a great book and covers the period style well. This book makes extensive use of the Picken Square. However, they do not identify any particular method by name. What characterizes the Halsam Method? I did a quick Google search and did not turn up anything. Find it under “LacisTools” > “Drafting Tools”. As a volunteer at the twice yearly Visiting Nurse Association rummage sale in NJ I see many donated patterns. Of course every sale is different but the variety is amazing and the usual price is 6 for $1.00 or .20 each. We sell hundreds. If you are in the area you should check it out – first weekend in May and October in Far Hills, NJ. Fabric donations are in the same tent – some vintage, some new from local decorators – who knows? and that is the fun. Pat, that sounds like heaven! If I was a bit closer I would totally be there.